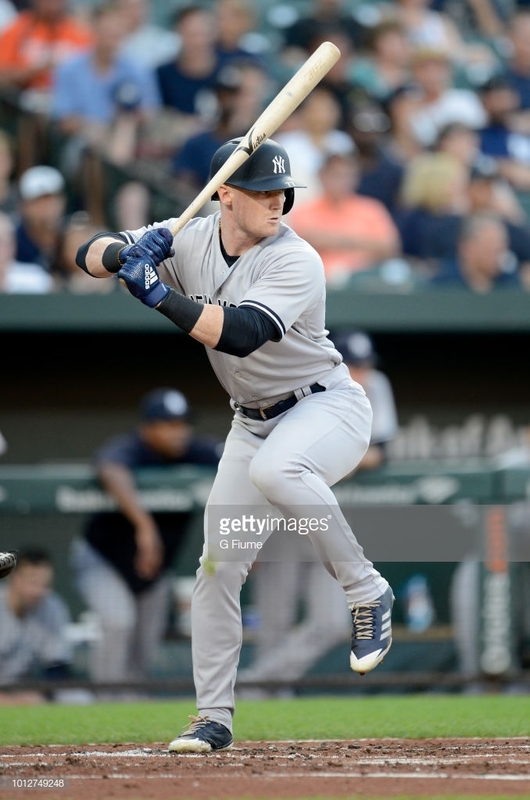 What does 2019 hold for Clint Frazier? Yankee fans are left with more questions than answers following Clint Frazier’s injury riddled 2018. Frazier suffered through concussion symptoms throughout his 2018 campaign, which saw him appear in 69 games between the minors and the big leagues. Now, Yankees fans wonder what 2019 will hold for the 24 year-old. Yankees' GM Brian Cashman recently said Frazier would be ready for Spring Training while at the GM meetings. What type of player should we expect come February when Spring Training starts? Looking at what we saw in his limited appearances last year, the future for Clint Frazier should still be very bright. In his 54 games between Triple-A and Single-A, Frazier slashed .305/.388/.562 and had 11 homers to go along with 24 RBIs. Those numbers, while in limited appearances, combine to be what is Frazier’s best statistical year in the minors thus far in his young career. For reference, in 2017 Clint appeared in 74 games for Scranton/Wilkes-Barre and had a slashing line of .256/.344/.473 while hitting 12 homers and knocking in 42 RBIs. In the majors, Frazier played in only 15 games before being sidelined in July with concussion symptoms that ultimately ended his season when he tried to return again in August. He played well, however, in those games albeit few of them, batting .265 and getting on base at a .390 clip. He never found his power in the big leagues, slugging just .353, though that can be explained through his limited time and his infrequent at-bats at the MLB level (his 15 games played with the Yankees were throughout 4 separate call-ups). So, now that we know Frazier will be healthy enough for Spring Training and that his concussion symptoms throughout 2018 shouldn’t have any effect on his level of play, Yankees fans have one question about 2019: where will Clint Frazier be playing? Let’s look at the options. 2019 could be the year that Clint Frazier finally gets his crack at the starting lineup for the Bombers. On Halloween, the Yankees declined Brett Gardner’s 2019 club option for $12.5 million, however re-signing the vet to a one-year deal worth $7.5 million. Gardner has been a staple in the Yankees outfield since the 2009 title team and is the team’s longest tenured player, however at the end of the 2018 season and into the postseason, Gardy had lost his starting gig in left field to the newly acquired Andrew McCutchen. In a year where Gardy saw his batting average and on-base-percentage drop about 30 points, rookie manager Aaron Boone began to see the veteran lefty as more of a bench presence than a starter out in left. With McCutchen, now a free agent following 30 games with the Bombers in September and October, out of the picture and reports hinting that the Yankees are not pursuing star Bryce Harper, Clint Frazier looks to be in the driver’s seat to be the starting left fielder for the Yankees in 2019. During much of his time in the New York Yankees organization, Clint has been recognized as a player who has been too good to store in the minors, but caught in a packed outfield that consisted of the likes of Aaron Judge, Giancarlo Stanton, Aaron Hicks, Brett Gardner, Andrew McCutchen, and the dreaded Jacoby Ellsbury. With McCutchen gone and Gardner likely moving to more of a bench role, along with Ellsbury missing from the face of Earth (not a complaint), Frazier could be looking at much more playing time in the big leagues for 2019. However, with the Yankees possibly pursuing Manny Machado in free agency, the move could clog some possibilities for Frazier. In order to make room for Machado at third (probably following the return of Didi), the Yankees could move Stanton to their starting left field role and place the oft-criticized Miguel Andujar and his poor defense at DH. This move could leave Frazier in similar waters that he has been treading in for years. With the imminent loss of Michael Brantley, the Indians will be looking for a cheap replacement for the three-time All-Star. As well, the tribe have announced a willingness to listen to offers for their veterans, including two-time AL Cy Young winner Corey Kluber who the Yankees have been linked to. Kluber posted a 2.89 ERA with 222 strikeouts in 215 innings last season and would be a nice addition to the Yankees rotation, however he would likely cost several of the Yankees’ top prospects. The Indians are very familiar with Frazier, having drafted him with the fifth overall pick in the 2013 draft. The tribe sent Red Thunder over in the deal for Andrew Miller in 2016, along with fellow top Yankees prospect Justus Sheffield. Similarly, the Yankees have also reached out to the Indians for starting pitcher Carlos Carrasco, who would also command a fairly hefty haul. The veteran right-hander posted a 3.38 ERA to go along with 231 strikeouts in 192 innings in 2018. Should the Yankees make a deal with the Indians for either of these highly-touted pitchers, Frazier’s name would definitely be a talking point in discussions. Another interesting trade partner with the Yankees could be the Seattle Mariners. The Mariners recently stated their intentions of restarting their team and attempting a rebuild. As a result, they have received a ton of interest from teams regarding ace southpaw James Paxton. The Yankees have been the team most linked to Paxton, and hope to add the lefty to their rotation. The talks so far don’t seem to be too close, with the Mariners looking for Andujar and prospect Estevan Florial in a deal for Paxton, per reports. When all is said and done, the Frazier could see himself get involved in this trade talk as he is a young talent with much team control left before he hits arbitration. As we sit here in November, it all seems plausible. However, I believe that, even with his improved stats in the year, 2018 truly hurt Frazier’s trade stock due to all of his missed time. It is very possible that in trade talks over the winter, teams could be viewing Frazier with much lower value than the Yankees view and Cashman refuses to trade him, similar to last offseason. His future with the team still looks murky right now, but we could have our answer for what 2019 looks to hold for Clint Frazier very soon.